Businesses, manufacturers, school districts and municipalities all face the same battle; minimizing one of the top expense lines in their budgets. Facility managers, administrators, CFO’s, engineers and others are invited to attend a free Energy Forum and hear solutions ranging from the very simple to the very complex efficiency opportunities, from experts who have implemented such measures in their own facilities. 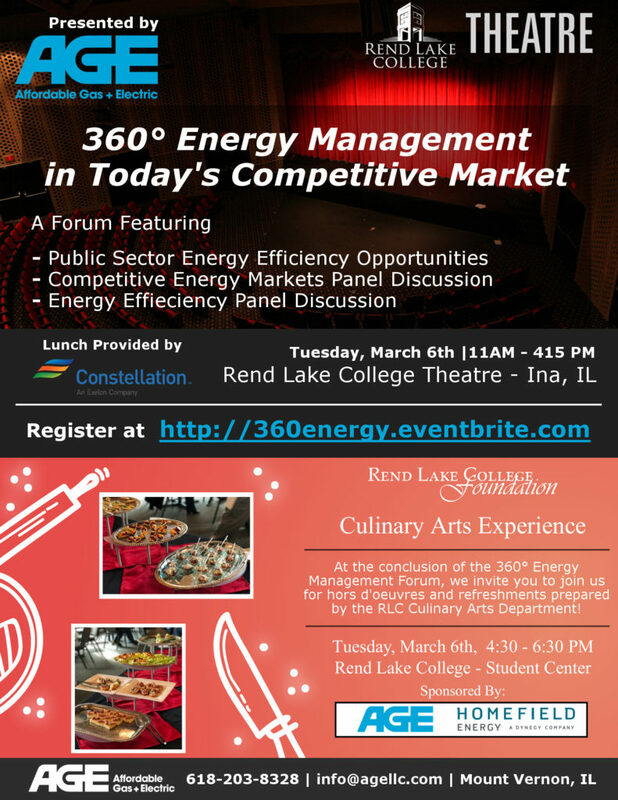 Southern Illinois Based, Affordable Gas + Electric (AGE), will present 360° Energy Management in Today’s Competitive Environment on Tuesday, March 6th at Rend Lake College in Ina, IL. The forum will feature several panel discussions and speakers who have expertise in both private and public funding of energy efficiency projects. Speakers and panelists will share costs, payback periods, starting points to identify low-hanging fruit and advanced practices that have been successful in local projects. The morning session will be specifically designed to address public sector buildings such as schools and municipal buildings, waste treatment facilities, etc. Recently, AGE applied for efficiency dollars for Mt. Vernon Township High School and was able to secure $324,000 on behalf of the district. Centralia Grade Schools are currently working on an efficiency project that has a very attractive payback period, with zero capital outlay on behalf of the District. A panel of experts will be discussing how many of these projects can actually be successfully completed without any initial capital outlay. An afternoon session will be highlighted by Continental Tire’s Facility Manager, Greg Brown. Greg has extensive experience in utilizing funds to help support his energy efficiency efforts at Continental Tire. A featured speaker at previous Ameren energy efficiency events, Greg will share his expertise in simple projects with very short payback periods to more complex load monitoring types of opportunities. Additional experts will then participate with Greg in a panel discussion and Q&A about how small business and manufacturers can take advantage of energy saving dollars that are available. The energy efficiency panels for public and private sector entities will sandwich a panel discussion on the current state of the energy market. Representatives from Dynegy/Homefield Energy and other leading suppliers will be on hand to provide their perspective of the current energy market as well as what the future of electricity and natural gas prices may look like. The Energy Forum is open to all private and public sector parties as well as the general public. To register for the event, please visit https://360energy.eventbrite.com.